Jimdo is a contemporary website builder created with the needs of individuals and businesses in mind. The platform comes full-packed with web design features and tools that contribute to simple yet effective web design process. The time you’ll need to master the system will depend upon the website editor you will eventually go for. The website builder allows designing websites in two modes. The first one is the classic website editor, which offers intuitive and simple WYSIWYG process. You’ll need certain skills and background to launch websites with it, but you will eventually reach the desired result with the right approach and consideration of all the crucial nuances. The second way you can go is to use the advanced Jimdo Dolphin tool. This is the Artificial Intelligence feature, which makes it possible to create websites in the automatic mode based on the content you will submit. This takes a few minutes only and always ensures decent result. This is what newbies like most about this Jimdo feature. Which option will work best for your particular website? This depends upon your skills and result you expect to get in the long run. Let’s have a look at the best samples of Jimdo websites created in both ways now. They are designed by real people, for real personal and business needs. This will give you the idea of how your project may look. It’s time to get started! 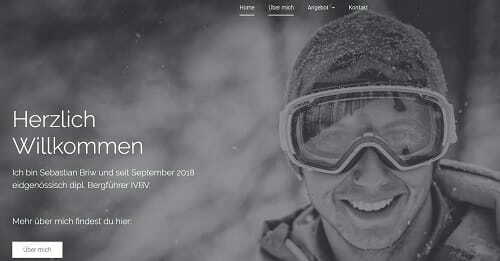 Sebastianbriw.ch is a German-based website of a mountain guide, Sebastian Briw. The website was created with Jimdo Dolphin and encompasses the best features of a classic website. There are only four menu sections here, but you don’t actually need more. It has everything potential clients need to find out the exhaustive information about the website owner and the services he offers. The website itself is designed in the black-and-white color scheme, which gives it simple yet stylish look. A full-scale photo of Sebastian creates positive and credible impression, urging the desire to keep browsing the website. This is a nice presentation of the website created with Jimdo Dolphin! 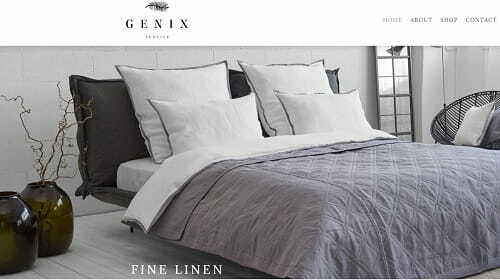 Genix-textile.com is a web store of the European brand offering high quality home textile linen products for sale. The website was created with a standard WYSIWYG Jimdo editor and looks stylish and trendy. The only glance at the project creates soothing and comfortable impression, which is so crucial when it comes to linen products. There are the detailed descriptions of each item, all coming with several photos. The site is accomplished in the simple light color scheme, with dominating white, blue and grey colours. The Contact Section and social network buttons make it simpler for a customer to get in touch with web store representatives to clear out the details. It’s stylish and so natural! If you need a standard sample of a Jimdo Dolphin website, then you don’t have to go any further – Combatladies.com works great for this purpose! This is the website of the studio practicing martial arts and self defense for ladies. The studio is owned and run by Sonja Blade, who sees her mission in teaching women the art of self defense. The website is pretty simple, yet it conveys maximum amount of information ladies should be interested to find out. The domainting colours are white and grey, which creates simple and calm feeling, when you browse the website. Home, Training and About Sections are available here, but you can find out more, having joined the groups in the social accounts. The corresponding buttons are also available at the homepage. Portfolio websites don’t have to be large and full-featured to attract user attention. Chrisfiddrich.net is a decent sample of such a project. It is modern, informative and convenient to browse. The website features intuitive navigation and you won’t get lost in the abundance of web pages or sections. With only three pages – Home, Portfolio and Contact – you will find out answers to all your questions. 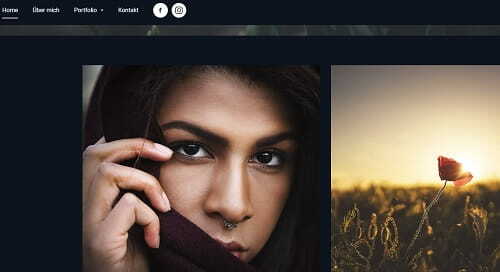 The website is created in German because of the nationality of the photographer – Chris Fiddrich. However, it is absolutely understandable and displays the best works of the author to the advantage. Is there anything else potential customers might need? Dennisvanaarssen.com is another outstanding example of a website launched with Jimdo Dolphin. The website belongs to Dennis van Aarssen – a pop, rock and jazz singer. The major idea of the project is to present Dennis’s creativity to the audience and provide enough information about him. Simple color palette, lots of videos of a singer and his portfolio, access to social network buttons and contact info… This is more than enough for a user to get the idea the website owner wants to convey. The project is quite simple, but this is a nice choice for a personal portfolio website! 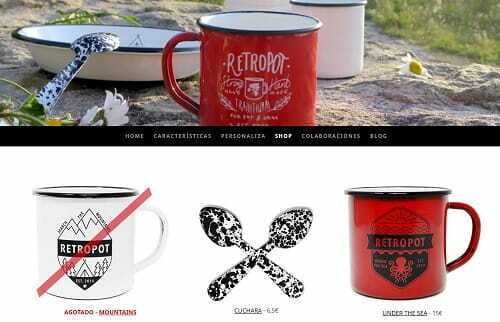 Retropot.es is a Spanish-based web store offering versatile retro kitchenware for sale. The products presented in the catalogue have unique designs and can be personalized with regard to your needs and preferences. The website looks neat and interesting. Created with classic Jimdo editor, it features intuitive navigation, logical structure and unusual design. The web store abounds in the original photos of products and their collection, each of which comes with detailed characteristics and shopping options. A blog and social network buttons grant access to additional info about the products. This is useful and convenient. A decent eCommerce website designed with Jimdo! Interior design company Studio23.re has wisely chosen the Rio de Janeiro template, one of our favorite Jimdo’s designs. It’s all about images. If you have some great pictures, Rio is the perfect theme to show them off. Consistent coloring throughout the website plus easy-to-read fonts and a simple navigation bar complete the lovely look of the site. Its usability, though, could be slightly improved. E.g. the menu buttons are not readable enough against some of the background images. And there’s also a question about the references in the bottom part – they are supposed to be links but they are not clickable. 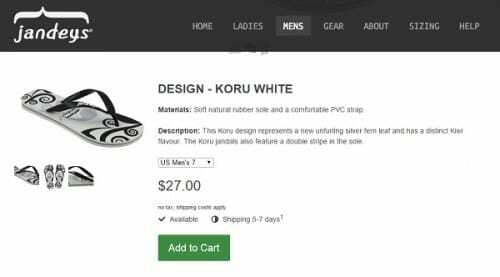 Jandeys.nz is an excellent example of a simple eCommerce website built with Jimdo. It has a user-centered horizontal navigation bar, easy-to-browse collections and beautiful background images. Check out the way they present their products using lots of whitespace around them, detailed description and multiple product images. Each product page provides all the information shoppers might need: item availability, materials, size options, taxes, and shipping info. It’s always a good idea to stick the menu bar on top The only thing I’d like to note is some of the background choices that make the text in the footer difficult to read. Still, all in all, the website looks great. Only one word. Classic. Mayfair.Fashion is a beautiful digital home for a Dutch company selling elegant clothing. Their website impresses with consistent colors of black and white scheme, just the right fonts and professional photographs. Utilizing the hottest web design trends such as homepage slider, sans-serif fonts, ghost buttons, long-scrolling homepage and lots of whitespace, among others, Mayfair is everything a modern eCommerce website should be. It has lots of categories, collections and items, but still you don’t feel like your head is going to explode because of just too much information. Everything is in its place, right where you need it to be. ArtisticDryCleaners.com is a great example of a small business website. Andy and Young are the owners of the firm since 1986. Note how well-branded the website is: from the custom favicon to the professionally designed logo and down to the footer – Artistic Dry Cleaners impress the visitor with their consistency and minimalism. The site does a great job of using pictograms to demonstrate the various services of the company, while the simple structure of the website makes it easy to immediately find the most important information. You can find a review page (actually, it directs you to another website, but still) where you can find customers testimonials. In general, the website is pretty simplistic in everything that is related to the functionality. What started as a hobby for AccessoriesByAsh.com quickly turned into a thriving business. Allison handcrafts beautiful woven jewelry in her Brooklyn, NY apartment and strongly believes that one piece of jewelry can make an outfit. At the core of her arts are the intricate knotting details that she learned while preparing a documentary on lobster fishermen in Maine. Allison uses Jimdo’s commerce platform to sell her handmade goods worldwide. At the core of her arts are the intricate knotting details that she learned while preparing a documentary on lobster fishermen in Maine. Her work is really good, you can find famous people wearing Allison’s handcraft, just open the Press section. But if she want to be even more successful, she’d better redesign her website in a more custom look and add a Back to Top button to the pages. 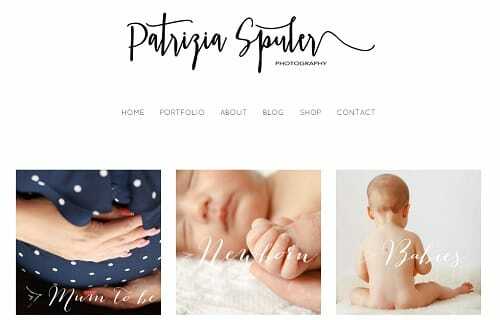 The fun, bright colors and fonts of PatriziaSpuler.com is a website of modern photographer Patrizia Spuler. Her work mostly connected with children – newborns and little babies, mothers and family. Here you can see a well-done combination of portfolio website and blog. Pages are not too long and the background is very bright. Patricia is a photographer and it’s crucial to her business to present her portfolio properly. The good thing is having the slider feature – just press play and enjoy. But it would also be great to view images in their full size, instead of the cropped slider versions. Ben Ahn is an `ukulele artist and vocalist from the island of Kaua`i, currently living in the San Francisco Bay area. He’s using his Jimdo website Benahn.com to share his passion for music, find potential clients, as well as display some client references. Though Ben’s website may feel simple, on closer inspection you can see it has everything a musician’s website needs: the story of the artist, videos, news, event calendar, and an easy way to get in touch. 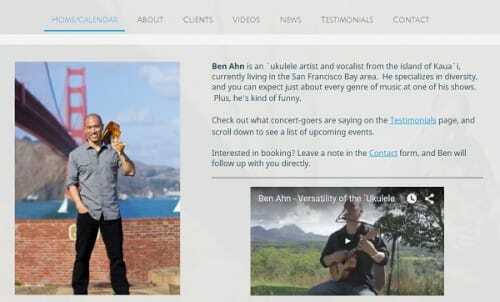 The result is an effective, modern website promoting Ben Ahn’s music to the world. You can find videos where Ben is in action and listen to his performances. And it’s lovely to see his availability calendar just on the home page. Tagnial International is an technology investment and development company providing all range of services both for new and established companies around the world. Their website, TaqniaInternational.com, successfully uses the Jimdo website creating technology. Here you can see a neat and modern design with amazing animated elements emphasizing company’s pursuit of innovation and sphere of interests. It’s good to see a well-optimized mobile version and a branded favicon, and I like how the colors are changing. The animated images are suited perfectly to the theme of the company. You really feel like future is standing on your doorstep, actually, it’s already knocking on your door. Bobsmade.com is another website of a custom painting company which makes ordinary things unique and awesome. Your shoes, snickers, headphones or guitar – almost everything you want could be painted with great design born in painter’s mind or in your own. It’s very exciting to explore the website from section to section, with lots of cool designs and images. I really don’t know a person who’d refuse to customize their Chuck’s?! You can find every help you need, from a size chart to a currency converter, it’s really convenient to have it all in one place instead of surfing the web from site to site. So, just several clicks – and your accessories are most unique and unusual! Jimdo is quite an unusual website builder, which provides users with two different web building approaches. Classic Jimdo editor and Jimdo Dolphin vary a lot, when it comes to the ease of use, convenience, web design skills and, of course, application sphere. As you see from the samples provided in the review, the AI Dolphin tool works best for the development of simple projects for personal use. These are portfolios, simple landing pages and standard websites that are not meant for business use. If you need a more complex project, loaded with features and advanced design approaches, then classic Jimdo editor is the option to consider. The platform will be of great help for designing business and eCommerce websites. For these projects, Jimdo provides all kinds of tools to make your website stylish, modern and successful. Use every option or feature of the website builder wisely, don’t overload the project with stuff you don’t need. Pay attention on how the results may differ if you pick a wrong color scheme or even a template itself. Take your time, no need to hurry with this one, explore the features and customizing options of your website, and you will get a truly magnificent result.